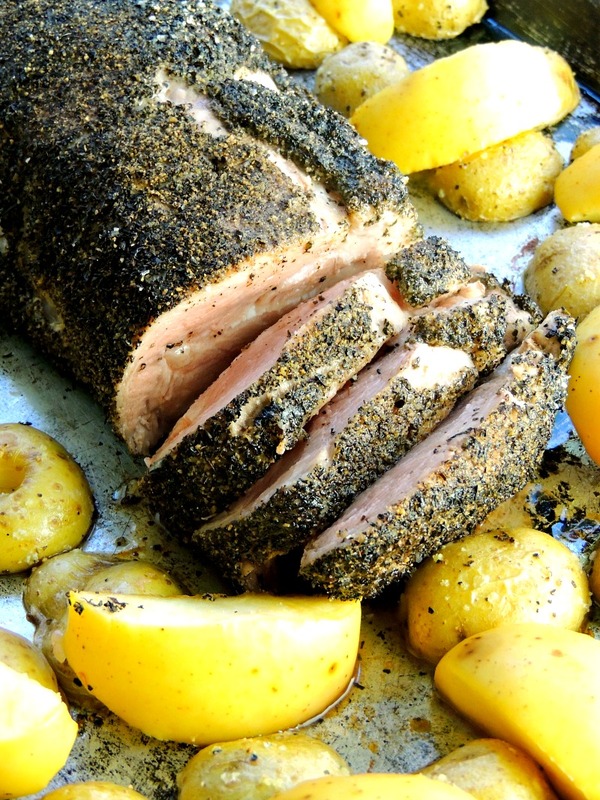 This pork loin recipe with apples and potatoes is easy to entertain with, or just treat the family to a juicy pork loin roast rubbed with citrusy Earl Gray tea, garlic, and onion. It is so delicious it will become a favorite I guarantee! So, this recipe has been hanging around in my head for quite some time. I have wanted to make something like this going waaaaaay back to my recipe for Sweet Tea Glazed Pear Bread. I mean, I have used coffee in rubs, like this Spiced Coffee BBQ Rub or Spiced Coffee Rubbed Steak that has ancho chile powder in it to give a nice smoky flavor. But, for some reason, tea just seemed a bit foo-foo for a meat rub to me. I have no idea why. I guess maybe the citrus/floral aspect to my fave tea, Earl Gray, just fit a dessert better in my mind. So I left it alone and went on my happy blogger way. Then, a few months ago, I decided to revisit the idea. 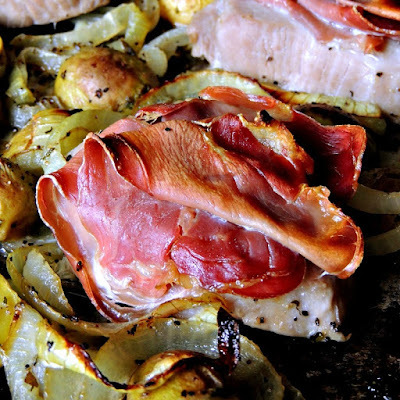 I have been roasting potatoes with apples for most of our pork lately and it is OhhEmmGeeee amazeballs! Kevin thought I was a bit wackadoodle at first, but once he tasted it he had to admit he was hooked and requests it a LOT!! Why, oh why, does he even question me? When you roast the apples they get soft and release some of their juices that then mingle with the salted roasted potatoes and BAM savory meets sweet and all is right in the world! Well, at least in our little culinary world, and sometimes that is all that matters right? I have been meaning to have the kids over for dinner to try this out on them. I love it that I have guinea pigs taste testers that live right down the street. I know the G-baby will love it, this is super kid-friendly. What kid doesn't like apples and potatoes? And she loves her meat, which makes me happy because I know some kids aren't big fans. Sit that girl down to some baked potato and bites of med-rare ribeye and watch a plate full of food disappear in no time flat! She will probably even want more. A little note about a few things I did with this recipe. First off I placed all of the potatoes cut side down on the baking sheet. That made for some golden brown yumminess that had me grabbing potatoes right off the pan. Burned fingers be damned, those potatoes are just too good to wait for! Also, we prefer our pork medium rare. Now that the threat of trichinosis had been removed from US domestic pork, medium rare is the way to go peeps! 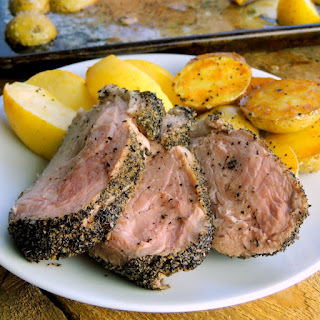 This roast was so tender and juicy it was crazy! On a side note, even if you are cooking for a small group suggest making the 3-pound roast and enjoy some awesome pork sandwiches, or pork fried rice, or even pork and eggs the next day! I also warm up the potatoes and apples and kind of mash them together with a little butter. Citrusy and floral, Earl Gray tea is combined with garlic and onion and paired with roasted apples and potatoes make for a delicious, easy to make meal the whole family will love. In a small bowl, whisk together the tea, garlic powder, onion powder, 1 tablespoon salt, and 1 teaspoon pepper. 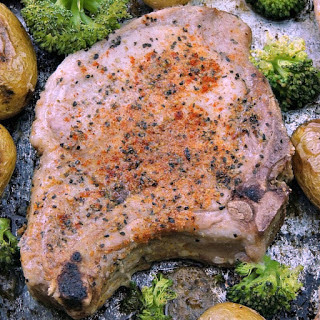 Rub all over the pork and set the meat fat side up on a large rimmed baking sheet. Cover and let stand at room temperature for 30 minutes. 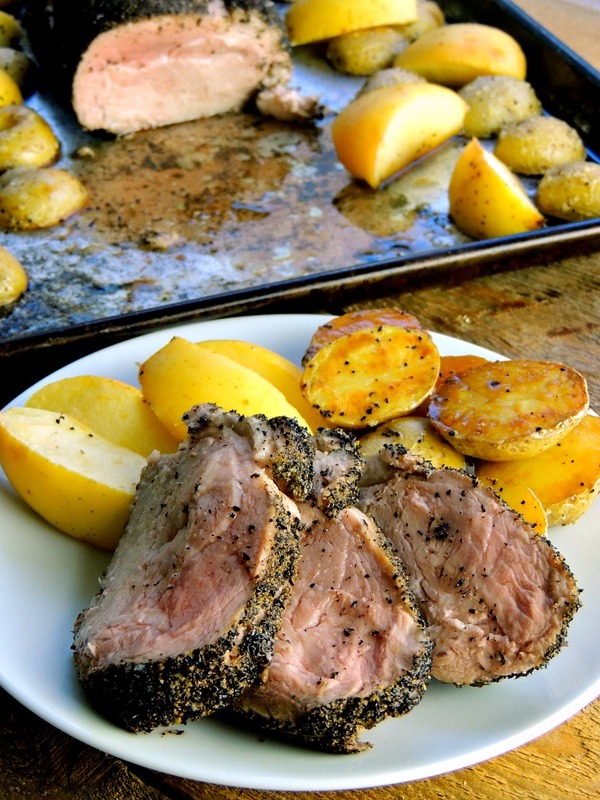 Toss the potatoes, in a large bowl, with 2 tablespoons olive oil, salt, and pepper and place cut side down on the baking sheet with the pork loin. Roast for 20 minutes, then reduce the oven temperature to 350 degrees, add the apples to the sheet pan, and roast for about 30 minutes longer, or until an instant-read thermometer inserted in the thickest part of the meat registers 135. Transfer the pork to a carving board, cover with foil, and let rest for 15 minutes before carving. Covering the pork and allowing it to rest will continue the cooking process and allow for the juices to remain in the pork. 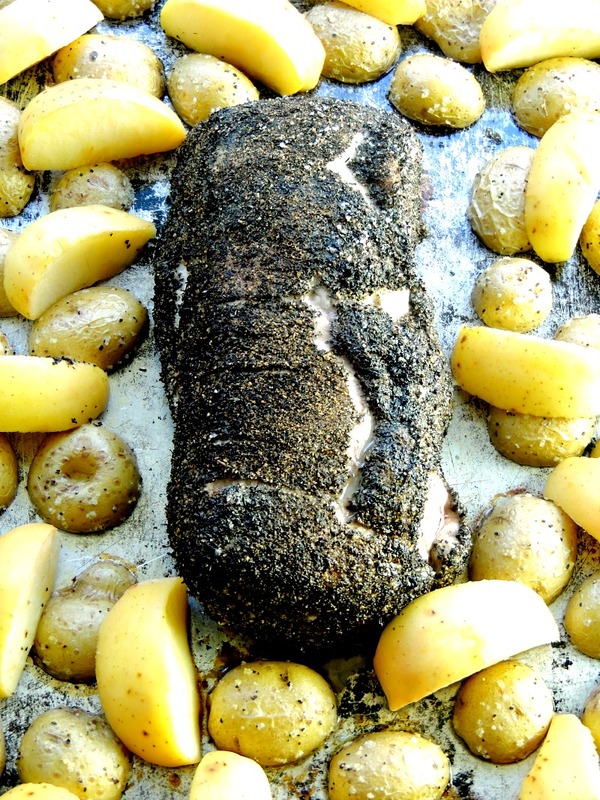 If you prefer your pork more on the medium side, roast to an internal temp of 140 to 145. Still looking for more great pork recipes? Very refreshing idea; since I am into Earl Grey I will definitely make it ! Thank you ! This recipe turned out amazing!! Thanks for sharing! We don't eat pork really but would this work on fish? That is a good question. I think it might, but I am not sure. I would use something like cod or tilapia if you do give it a try. Then just bake as you would normally bake your fish. Looks amazing! 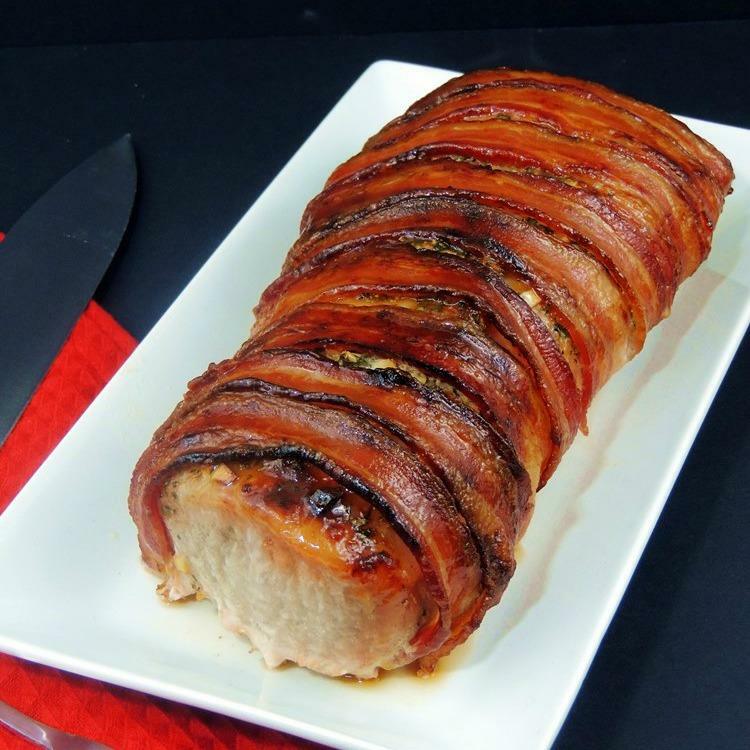 I love a good pork loin but for some reason I always forget to buy it. Thanks for reminding me! I love Earl Grey tea but I never would have thought to put it with a savory dish. It's so aromatic though it is perfect for the blank canvas of potatoes and pork. I love tea, I never though to use it this way though. I have to try this recipe. Thanks for sharing. 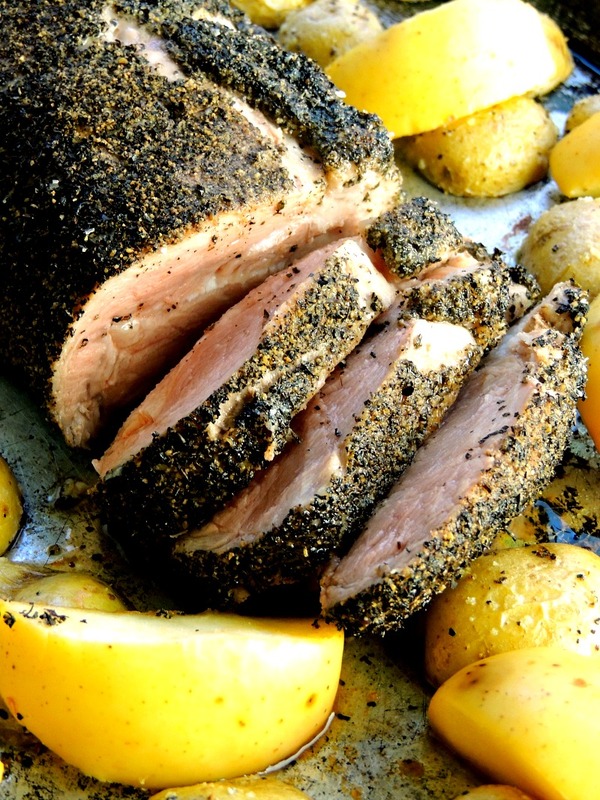 I haven't used coffee rubs for seasoning yet but this looks delicious. This looks amazing! I never would have thought to use a tea rub for anything really! I totally need to try it. I will try it tonight. I like the simple recipes that are great for you.